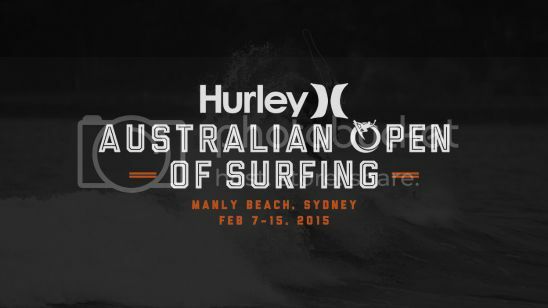 Hurley Australian Open WSL QS 6000 runs Feb 9th - 15th at Manly, Sydney. Adam Melling and Stu Kennedy will be there chasing the points after a great start to the year at Burleigh. Good luck fellas. Steph Single is competing in the womens event and starts in Round 3. Mello stuck to the rights in his round 2 heat but came up short and was eliminated in the small bumpy conditions. Stu surfs tomorrow. A solid win today for Stu in small tricky waves. He surfs next in round 3 Ht . Stu was ripping today putting together a 16.17 total, posting a win and moving into round 4. Steph surfed great but was eliminated in a close heat. Stu outsurfed the wee Irishman today and booked a round 5 match up with Ace. Stu played it smart today, putting in a tradesman like performance to move into the Quarter finals and grab a keeper result at the start of the '15 season. He surfs on finals day in QF 3 vs Freddie P.
Stu finished the event in 3rd today in 3' -4' onshore conditions. He took care of the Hawaiian in his Quarter final with some big turns and one huge full rota frontside air that was so close to perfect , he scored a 9.93. He had Andino for most of his Semi but was unlucky when the panel gave the American the score he needed for a pretty soft backhand air 180 flick . Stu will gain 3550 ratings points and starts his qualification campaign for '16 in a big way. Congratulations mate.